The 25 metre sailing yacht DjangoToo, listed for sale by Bernard Gallay Yacht Brokerage, has had a €300,000 price reduction. Custom built in aluminium by French yard Trehard to a design by Jacques Fauroux, Django Too was delivered in 1991 as a cutter rigged sloop with refits in 2007 and 2014. In 2007 she received new sails, electronics and all the navigation equipment was upgraded. Bureau Veritas classed, her interior, designed by Franck Reynaud, can accommodate up to eight guests in four comfortable double cabins. All cabins have en suite shower facilities and are equipped with LCD flat screen televisions, DVD drives and HiFi systems. In addition, there are quarters for four crew. The saloon of this yacht for sale is expansive and very bright thanks to numerous portholes while a large table in the dining area seats eight guests. Entertainment comes from a wide screen plasma television, a Bose surround sound system, the latest DVDs and a varied music collection. A favourite spot for al fresco dining is the deck cockpit featuring a new Bimini top and comfortable cushions. This is also a great place to enjoy a cocktail at sunset. Under power, a single 230hp Caterpillar diesel engine and 3,000 litre fuel tanks give her a respectable cruising range of 1,200 nautical miles at 8 knots. 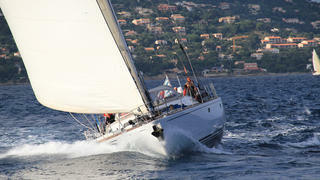 Lying in La Ciotat, France, Django Too is now asking €990,000.